At Metropolitan Dental Care, we believe in providing our patients with the best dental care possible in a warm and inviting environment. Our doctors and dental hygienists are passionate about providing treatments that will help keep your smile healthy and are committed to being upfront and honest about the care you need. While the American Dental Association recommends visiting the dentist every six months for routine cleanings and check-ups, if you have gum disease or other oral health concerns, the dentist may recommend that you have your teeth cleaned and examined every three to four months. At your examination, the dentist will perform a series of x-rays to check for any complications in the underlying layers of the tooth and jawbone. 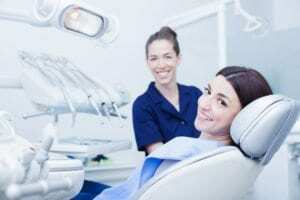 One of our dental hygienists will then thoroughly clean your teeth to remove any plaque buildup. If minor to moderate cavities are located, we offer tooth-colored fillings to help repair your teeth without disrupting the aesthetics of your smile. Our dentists use composite resin that can be color-matched to your enamel and then molded carefully over the tooth. A special curing light will harden and set the resin to provide optimal strength. If you have avoided going to the dentist for many years, or are unhappy with your current dentist, today is the day to make the switch. We invite you to tour our Denver or Lone Tree locations, whichever is more convenient, and meet our friendly staff. It is our desire to change your outlook about visiting the dentist for the better. To schedule your initial visit, send us an email or give us a call at 303.534.2626.